What happens on and in the oceans can be mysterious. Shipping can be a secretive and paradoxical industry and many are ‘sea-blind’ to our dependency upon it. The surface of the moon is better mapped than our ocean floors. 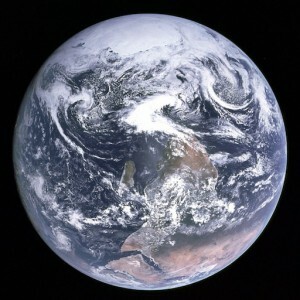 To change how we visualise and value the oceans, we could look at NASA’s famous 1972 Blue Marble image … upside down. The Apollo 17 astronauts actually snapped the picture this way, from what we would consider an unconventional vantage point. Our familiar world appeared the wrong way around to them, thanks to the orientation of their spacecraft. The photo, usually reversed when published, enables us to appreciate the sheer blue power and presence of the oceans. Africa is now not simply the second biggest continent, it is one of Earth’s great islands. Its shape and nature is determined by the huge surrounding oceans. World Oceans Day, celebrated today on 8 June, reminds us that healthy oceans are fundamental to life on Earth. We should be doing more to avoid further harm to them, such as by preventing plastic pollution – the theme for 2018 and of World Environment Day, which was on 5 June. Jumping forward from 1972 to World Oceans Day 2018, there is still something missing. Despite lying at the heart of the Blue Marble, African countries don’t play a big enough role in ensuring the sustainable governance, development and protection of the oceans. South Africa is championing and implementing ocean policies that aim to do just that. A forthcoming Institute for Security Studies report explores some of the challenges the country is facing in achieving this. South Africa only recently decided to prioritise ocean and maritime policies – partly for economic gain, and partly because of maritime security threats. For example as part of Operation Phakisa in 2014 it launched an oceans economy project in response to criticisms that implementation of its National Development Plan was too slow. Phakisa is intended to quicken the delivery of projects that contribute to national development and economic growth. The National Development Plan failed to discuss ways in which an oceans economy could contribute to achieving development goals and reduce the ‘triple threats’ of high levels of inequality, poverty and unemployment. However it did recommend a reappraisal of the maritime sector to determine the impact its growth could have on South Africa’s economy. The government launched Phakisa with impressive forecasts derived from this reappraisal. It suggested Phakisa would result in a GDP contribution of between R129 billion and R177bn and the creation of up to a million jobs by 2033. But the results of the Operation Phakisa oceans economy project have been modest, and the report shows that its 2033 targets might not be achieved and will need reviewing. The project cannot presently be considered the comprehensive or integrated maritime approach that South Africa needs. For instance, it doesn’t promote renewable energy and hinges instead on creating an oil and gas sector that will extract non-renewable marine resources. Future policymaking must take this and other issues like the future of fishing into account. The oceans mustn’t be looked at for their economic value alone – and more marine protected areas should be encouraged and declared. These areas are key to sustaining ocean health, and South Africa aims to expand their coverage to 20% of its exclusive economic zone by 2028 under its National Protected Areas Expansion Strategy. South Africa’s unique and strategically important geographic location (it is surrounded by three oceans – the Atlantic, Indian and Southern) presents it with a complicated set of maritime security challenges. About 80 to 95% of all South African trade has a maritime element. Any disruption to shipping in the Indian Ocean, such as the spread of piracy from Somalia, would be a costly threat to both South African trade and that of inland countries that depend on South African infrastructure. An erosion of South Africa’s naval and maritime security capacity is curtailing its ability to act against maritime criminals and enhance good ocean governance. A key recommendation of government’s report is to better pursue the fifth initiative of Phakisa’s Marine Protection Services and Governance Lab. This advocates an integrated enforcement mechanism comprising all of South Africa’s capacity to produce the holistic approach needed to protect the oceans. Several government departments own ocean-going platforms, enforce South African laws at sea and have conducted operations with neighbouring states to guard their own marine resources. The final piece of South Africa’s approach takes us back to the new view of Africa – creating greater coordination of everyone on and around the great island. Therein lies a problem – Africa is presently almost too big and disconnected from the seas. It needs platforms where like-minded states and stakeholders can jointly pursue maritime goals. South Africa’s chairing of the Indian Ocean Rim Association until September 2019 offers an opportunity to provide a forum for African states of the Indian Ocean to elevate an African maritime agenda. South Africa also looks to encourage progress at the African Union level. This will require it to strengthen the implementation of continental maritime initiatives. World Ocean Day is a call to action. It isn’t just about sustainably deriving more wealth from the oceans or defeating piracy. The efforts of countries like South Africa to surround the great island of Africa with safer and healthier seas are ultimately good for the whole world.